This fine plant has been recognized by its achenes in deposits of Interglacial, Neolithic, and Roman age. It is found in the Warm Temperate Zone, in Temperate Europe, N. and W. Asia, as far as the Himalayas. It is absent in East Cornwall, South Wilts, Gloucester, Worcester, Carmarthen, Cardigan, Montgomery, Denbigh, Mid Lanes, Isle of Man, Peebles, Selkirk, Haddington, Stirling, Kincardine, Banff, Westerness, Cantire, S. and Mid Ebudes, W. Ross, Sutherland, Caithness, and the Northern Isles. It is local in Ireland, and is found in the Channel Islands. The Great Spearwort is an aquatic Hydrophyte or water plant, or Hygrophyte or moisture-loving species, living in the middle of pond or lake, half-submerged, and being also a typical marsh plant, occurs also in swamps and ditches. Usually it grows some distance from the margin, and in this way is hard to reach, unlike its congener the Lesser Spearwort, which is found on the ground surrounding a pond or in marshes and wet ground. With the Greater Spearwort grow Frogbit, Bur Reeds, the Sweet and Yellow Flags. Though aquatic it is erect, and grows out of the water in the same way as the Flag or Reeds. It grows in a group of some extent, usually not in deep water, or in wet, peaty soil. It is tall, erect, and graceful, and the flowers being largely terminal and bright yellow form quite a golden patch in the otherwise green marshes. The stem is hollow. Perhaps from the long, entire, spear-shaped, aerial leaves, giving the English name its significance, one can best recognize this handsome species. They are half-clasping, and the radical leaves are stalked, while the rest are not, and have a semi- rather coarsely-toothed edge. The lower, sometimes submerged, leaves are tongue - shaped (hence Lingua) or heart-shaped, blunt, 3 in. broad, 8-9 in. long. The carpels are pitted and have a swordlike beak. The flowers are large, yellow, nearly 2 in. in diameter, in a sort of panicle. The glands of the petals have a small scale. The achenes are pitted. The style is broad. Great Spearwort varies from 2 to 4 ft. in height. Mowers can be found from June to August. It is a perennial, deciduous, herbaceous plant. Pollination is as in the Lesser Spearwort, where the flowers are scarcely expanded when the anthers open outwards, covering the sides towards the petals with pollen; but in this case the stigma is mature first. Insects in the case of the former feed on the abundant honey in little scales at the base of each petal, and so dust themselves with pollen at the same time. The stigmas are concealed by the stamens and undeveloped. As the stamens open they bend out, and turn their pollen-covered sides outwards. The outer stamens develop before the innermost stamens join the others, and the stigmas becoming dusted with pollen, can be pollinated with their own pollen or that brought from other flowers. All visitors alighting on the middle, bearing pollen, cross-pollinate some stigmas, those alighting first on petals touching the anther and stigmas, either causing cross- or self-pollination. The flower being half-drooping may also be self-pollinated from this reason. The visitors are Flies, or Diptera, Syrphidae, Syritta, Cheilosia, Meli-threptus, Muscidae, Scatophaga, Anthomyia; Hymenoptera, Apidae, Halictus; Lepidoptera, Satyrus, Pamphilus. 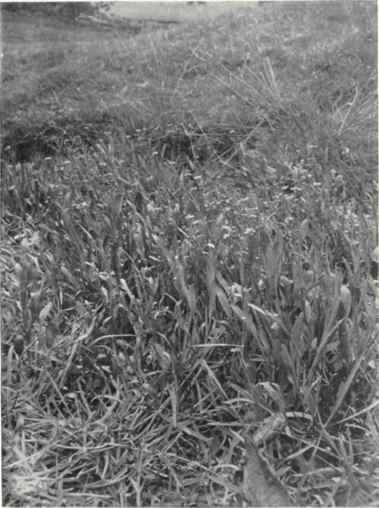 Spearwort is dispersed by its own agency. The achenes are aggregate, and dispersed around the parent plant. This handsome species is a Hydrophyte or water plant and aquatic, or a Helophyte or marsh plant. A fungus, Aecidium ranunculacearum, forms orange-yellow groups of "cluster-cups" on the leaves. The specific name (once a genus) Lingua was bestowed by Pliny, and means a tongue, and was used in allusion to the shape of the leaves. Possibly Pliny's plant, however, was the Hart's Tongue. It is called also Spear Crowfoot and Sparrow Weed. The Lesser Spearwort was used under the name "flame" as a cure for "cankers" or ulcers. It is a poisonous plant, and the Lesser Spearwort is of the same nature. Essential Specific Characters: 6. Ranunculus Lingua, L. - Stem-leaves entire, subserrate, sessile, stem erect, flowers large, yellow, carpels pitted, style broad with ensiform tip.